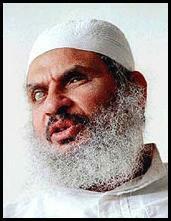 Since Omar Abdel-Rahman, the blind sheikh (or blind sheik) of New York, was arrested on terrorism-related charges in 1995, his Islamist friends have been threatening that if anything befalls him, they will avenge him. Perhaps he is trying to provoke them into action by slowly committing suicide. This explanation comes to mind on learning about Abdel-Rahman's otherwise mysterious behavior. Edwardy told how he repeatedly urged a reluctant Abdel-Rahman, who suffers from diabetes, hepatitis, gall stones, artery disease and high blood pressure (plus, he had a heart attack in 1985), to take his medicine and eat properly. But Abdel-Rahman prefers the high-fat, high-salt, high-calorie food from the commissary, which threaten his life, to specially-prepared foods made for him. "He would buy things from the commissary which were the worst choices that a diabetic could make," Edwardy observed. In addition, the sheikh went on fasts and refused his medications "seemingly for no good reason that we could figure out." Things got so bad, the medical center staff asked the Abdel-Rahman's wife to convince him to "please take his medicine." Sheikh Omar Abdel-Rahman continues to be revered by radical Muslims around the world who view him as their spiritual leader. Both Bin Laden and al-Zawahari, who is now his deputy, have vowed to take revenge against the United States if Abdel-Rahman, a diabetic, dies while in a US jail. They allegedly agreed that Abdel-Sattar should claim prison officials were denying him treatment for diabetes when he was, in fact, refusing medical care. Statements made by Abdel-Rahman's family confirmed that his health condition deteriorated drastically and that he was not given adequate medical care. Comments: (1) It bears recalling that Al-Qaeda distributed Abdel-Rahman's last will and testament at a May 1998 press conference; in it, he stated, referring to the American authorities, "My brothers, if they kill me—which they will certainly do—hold my funeral and send my corpse to my family but do not let my blood be shed in vain. Rather extract the most violent revenge, and remember your brother who spoke the truth and died for the will of God." Oct. 3, 2005 update: According to Abdel-Rahman's wife Aisha, his condition is deteriorating, although she curiously makes no mention of his long list of alleged maladies. Since the attacks on September 11, 2001, Sheikh Abdul Rahman has been living in total seclusion and suffering from diabetes, which has caused him to lose all feeling in his limbs, especially his hands, making reading by Braille impossible. He was also very frail as a result of high blood pressure and chronic respiratory problems. 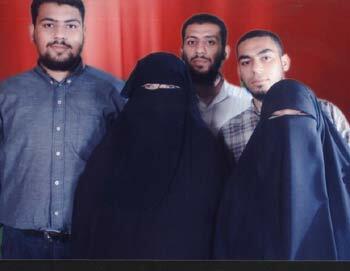 Recalling her sole visit to her husband in his US jail, Aisha, said, "Conditions inside the jail are very bad. The Sheikh is under constant surveillance with a number of cameras following his every move, 24 hours a day. He even has to wash his own underwear." She complained that her husband lacked "someone to organize his belongings. He has no one to speak to, day or night, and no Muslim or Arabic-speaking prisoner to relate to. He is always on his own." Claiming the cleric was a victim of racial discrimination, Aisha added, "If an other prisoner called the guards, they immediately attend to his needs. My husband, however, knocks on his cell door for hours and to no avail." Sheikh Omar, Aisha continued, had not been allowed to pray on Fridays, despite the claims by the US authorities that they believed in one's "freedom of ideology and religion." The Al Azhar scholar, who has a doctorate in the science of the Quran with distinction and spent forty years lecturing about Islam, has been reduced to a "crazy person" as guards believed he suffered from mental illnesses. Describing her visit, Aisha said prison guards had informed her "You will not be able to shake his hand and the meeting will be record." She remembers entering "the room from one door while Abdul Rahman entered from another. We sat on either side of a large table, with about 2meters separating us. Every time I spoke to my husband, I had to raise my voice so the guards and everyone else present in the room could hear me." In the last letter she received from Sheikh Omar, Aisha said he complained of feeling under siege as no information from the outside reached him in solitary confinement. As no Arabic speakers were ever present at his side Aisha feared he would break down mentally were it not for reading the Quran. In his letter, Abdul Rahman wrote, "I am cut off from the outside world. No one knows what [the guards and prison authority] are putting in my food or drink; they might want me to die a slow death. They might be adding poison to the food or medicine. I might be given some bad outdated medicine or drugs that kill me or kill my sanity." Lately, he added, "I have noticed strange odors from the floor above my cell as well as a continuous "Woosh" sound, similar to that of an outdated air-conditioning unit, as well as knocking and thumping noises, similar to that of explosives, day and night..." He expressed his fears that the prison authorities would "make up lies and excuses and no one would believe my fears. They are experts at lying." Comments: (1) This sounds like further preparations for outrage when the blind sheikh dies. (2) In a curious aside, Aisha had herself photographed in order to "add a human touch to her story." Trouble is, she was photographed in a niqab, rather taking away from her humanity. Sep. 11, 2006 update: In a video today, marking the fifth anniversary of 9/11, Al-Qaeda's reputed no. 2 leader, Ayman al-Zawahri, called on every Muslim "to make use of every opportunity afforded him to take revenge on America for its imprisonment of Sheikh Omar Abdel-Rahman." Dec. 14, 2006 update: Looks like Abdel-Rahman may be getting his wish to die. In a two-page bulletin, dated Dec. 8, the FBI reported to federal intelligence officials that Rahman was rushed from prison to a Missouri hospital two days earlier for a blood transfusion. There, doctors discovered a tumor on Rahman's liver, according to the bulletin, which was described to The Associated Press by a law enforcement official. But U.S. Bureau of Prisons spokeswoman Tracy Billingsley said Rahman's condition has stabilized, and he has since been moved back to prison. "His condition has improved," Billingsley said. Mar. 5, 2007 update: Montasser al-Zayyat, Abdel-Rahman's Egyptian lawyer, says his 68-year-old client has severe medical problems: "He has multiple health problems: diabetes, a weak heart, kidney trouble. All these problems have come together ... He's nearing death." After his December health crisis (see prior update), Abdel-Rahman's condition stabilized and he was sent back to prison on Dec 11. Al-Zayyat has this information from the 10-minute phone call Abdel-Rahman is allowed to make each month from his present location, the U.S. Medical Center for Federal Prisoners in Springfield, Mo. Despite Abdel-Rahman's ferocious last will and testament (see above), Al-Zayyat expects his death will not lead to an outbreak of violence, in part because his Egyptian followers have been broken by the government, in part because Abdel-has been ill for so long that his death is expected. "I don't anticipate a huge reaction. His followers know that he's been in poor health for years." 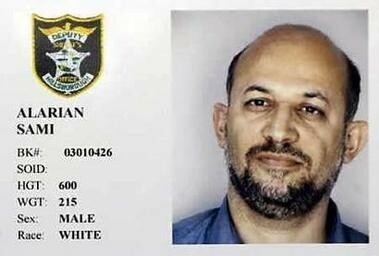 Sami Al-Arian, a co-founder and the North American leader of Palestinian Islamic Jihad. Apr. 15, 2008 update: Is Sami Al-Arian, a co-founder and the North American leader of Palestinian Islamic Jihad, taking a leaf out of Abdel-Rahman's playbook and starving himself to death to benefit his political cause? Joe Kaufman raises this possibility in "Al-Arian Starving for Attention." It has come to our attention that Shaykh Omar Ahmad Rahman aka "The Blind Sheikh" has not had a Muslim visitor in 20 years! I am very surprised at this, because when I post something about him I hear from people who seem to care about him. If any Muslim reading this is in North Carolina, or knows someone in North Carolina who could pay the Shaykh a visit I am sure it would be greatly appreciated. ... the prison will not allow Arabic Speaking visitors. I do not know how they can get away with this kind of discrimination, it's ludicrous, so please speak only english. Feb. 18, 2017 update: Abdel-Rahman has died at 78. Will riots follow? Feb. 22, 2017 update: No, riots did not follow. The only large event following the Blind Sheikh's demise was his funeral in Al-Gamaliya, Egypt, where some of the thousands of mourners carried signs reading "We will meet in heaven" and chanted "We will defend you with blood and soul, Islam."